Through the colorful autobiography of pickpocket and con man George Appo, Timothy Gilfoyle brings to life the opium dens, organized criminals, and prisons that comprised the rapidly changing criminal underworld of late nineteenth-century America. 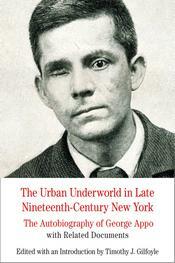 The book's introduction and supporting documents, which include investigative reports and descriptions of Appo and his world, connect Appo's memoir to the larger story of urban New York and how and why crime changed during this period. It also explores factors of race and class that led some to a life of crime, the experience of criminal justice and incarceration, and the masculine codes of honor that marked the emergence of the nation's criminal subculture. Document headnotes, a chronology, questions for consideration, and a selected bibliography offer additional pedagogical support. "In the skillful hands of Timothy J. Gilfoyle, opium dens, con men, prisons, and pickpockets bring nineteenth-century America to life. Students will be captivated by the autobiography of the remarkable George Appo as they encounter it through this lively and engaging book."